Above is the discussion document for the 2018 review. If you would like a copy please ask. There are a number of proposed changes. Currently the Government are asking for feedback. Feedback closes on 30th September 2018. This page will be updated as new information comes to light. Some of the proposed changes will directly impact the role and working conditions of our Educators. The aim of this page is to keep our Educators and whanau informed of the most current information available. 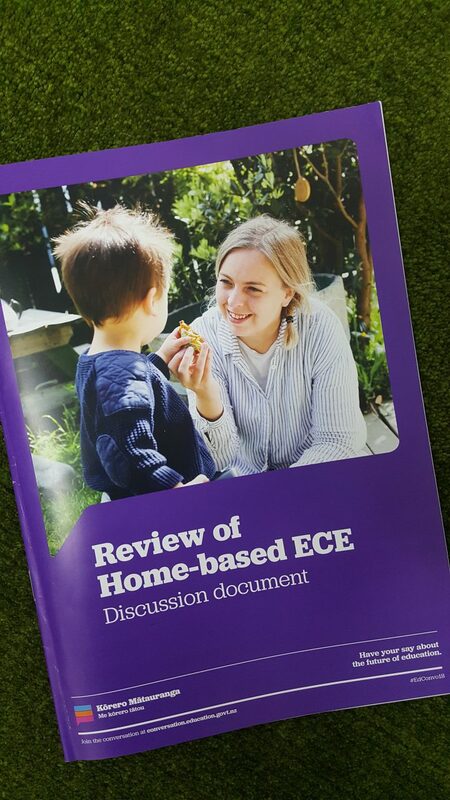 I had the opportunity to have a direct discussion with the Government Review Team at the Homebased Childcare conference over 21st – 23rd September. I also listened to Hon. Tracey Martin – Minister for Children and acting Minister for Education. FROM THE FEEDBACK ALREADY RECIEVED, THEY HAVE REALISED SOME OF THEIR PROPOSED CHANGES WILL NOT BE FEASIBLE – SO THE HAVE BEEN CANNED (not supported). They have already received about 80 detailed submissions and over 1400 online surveys. They have also been holding discussion Hui around the country and have engaged with over 450 service providers and over 300 Educators. They were hoping to get feedback from Educators, but were not really expecting it … so they have been stoked to received some great ideas. Level 4 qualification requirement. This proposal has been largely supported, but is currently under great debate as to how it may happen. Any change will be developed and implemented over a 2-3 year period. You would NOT be required to have a Level 4 qualification prior to working as an Educator. You will be able to study while working, as we do currently. Discussion suggests, prior learning, qualifications and experience will all be considered and applied towards credit for the qualification requirement. You will NOT lose your prior qualifications. It is suggested that your Visiting Teacher can work alongside you to apply your already acquired knowledge to any new qualification required – this means you are fully supported and will not be required to study on your own. Homebased Childcare is not being picked on – there is currently a 30-year strategic plan being written for the whole education sector.